Bestselling author Adam Kay channels Henry Marsh and David Sedaris to tell us the hilarious -- and sometimes horrifying -- truth about life and work in a hospital. Welcome to 97-hour weeks. Welcome to life and death decisions. Welcome to a constant tsunami of bodily fluids. Welcome to earning less than the hospital parking meter. Wave goodbye to your friends and relationships. Welcome to the life of a first-year doctor. 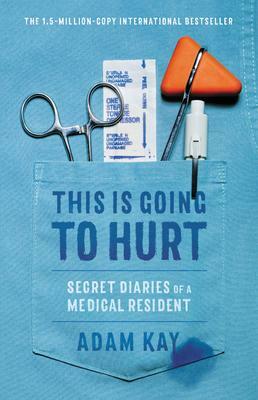 Scribbled in secret after endless days, sleepless nights and missed weekends, comedian and former junior doctor Adam Kay's This Is Going to Hurt provides a no-holds-barred account of his time on the front lines of medicine. Hilarious, horrifying and heartbreaking by turns, this is everything you wanted to know -- and more than a few things you didn't -- about life on and off the hospital ward. And yes, it may leave a scar. Adam Kay is a comedy writer and script editor for TV and film. During his transition from doctor to writer he established himself as a musical comedian as frontman of Amateur Transplants, achieving great success and over 20 million YouTube hits. He lives in London.